Note: 2020 will be added in early 2019 and will be included as an update for anyone who purchases the game now. Are you ready to become the most powerful political leader in the world? Prove it in this definitive political election game. 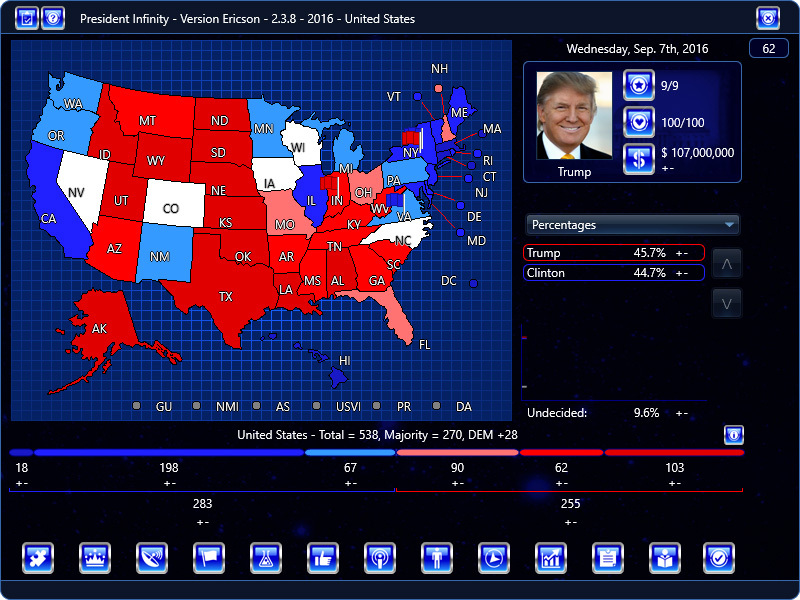 President Infinity is a sophisticated strategy simulation that delivers both gameplay and realism. More campaigns – President Infinity comes with 2016, 2012, 2008, 2004, 1980, 1972, 1968, 1912, and Florida – 2018 – Senatorial. 2020 will be added in early 2019 and will be included as an update for anyone who purchases the game now. Includes both the general election and primaries, with over 40 candidates to choose from and 4 parties. 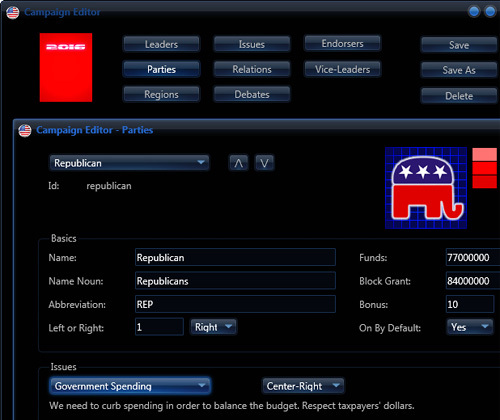 Campaign Editor – modify leaders, parties, surrogates, endorsers, and more – or insert yourself and run for President! Most realistic campaign experience besides actually running. 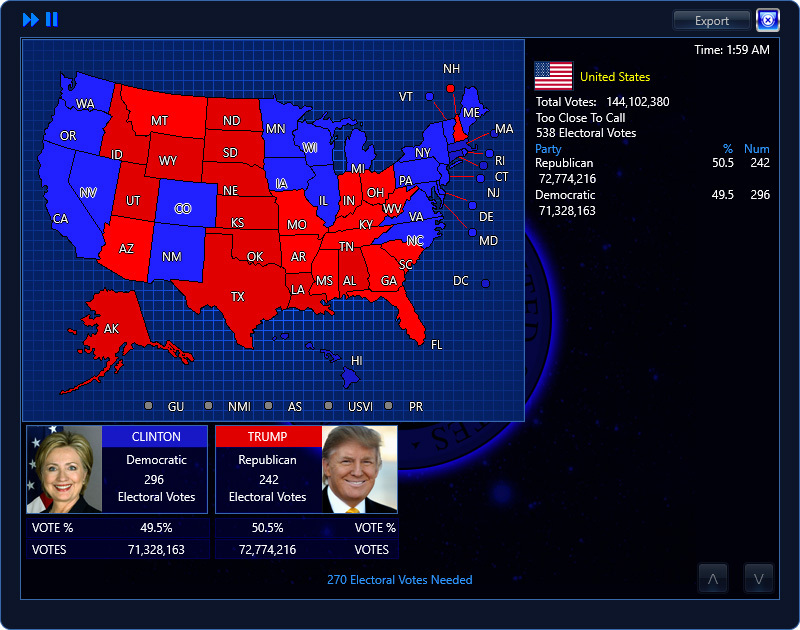 Simulation mode, where you can run trials of an election campaign and see what the average results are. 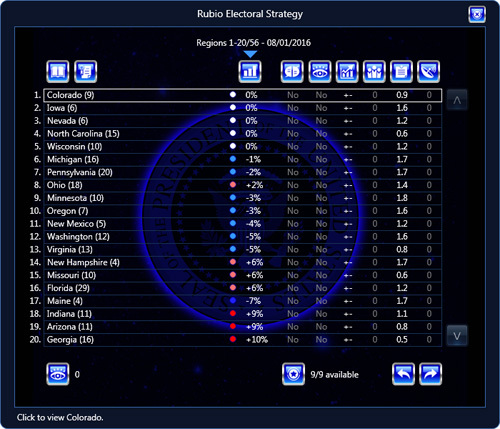 A world of user designed campaigns, including for Gubernatorial and Senatorial campaigns. More info on features and game-play below. The fate of the nation is in your hands. Your goal is simple – win the Presidency. How do you win the Presidency? Win enough Electoral College votes to win the election. You are responsible for all aspects of your candidate’s election strategy: planning and buying advertising, conducting fundraising, giving speeches, recruiting high-profile and grassroots supporters, and spinning news. 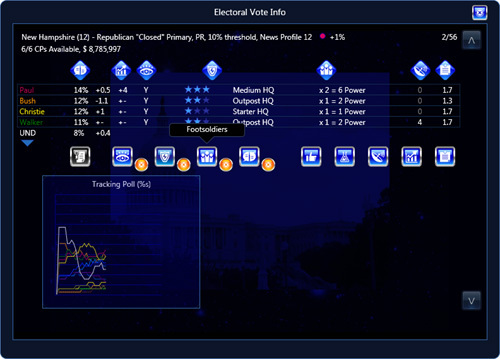 President Infinity is the closest thing there is to running a real campaign, and this series of games has been used by political institutes, campaigns, universities, and high-schools to gain insight into aspects of the campaigning process. The 2016 campaign has over 40 candidates to choose from, and the Republican, Democratic, Libertarian, and Green parties. 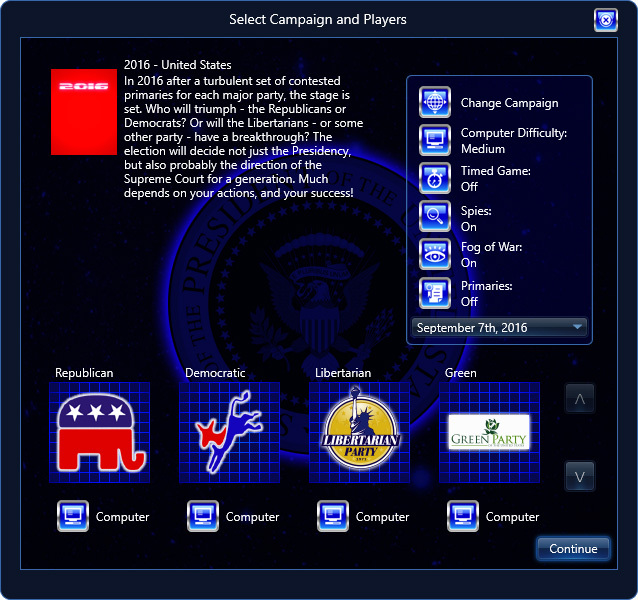 The game includes 2016, 2012, 2008, 2004, 1980, 1972, 1968, and 1912 campaigns, and more are added on a regular basis. Start at different dates for primaries or the general election, with candidates who have declared they are running or are undecided. 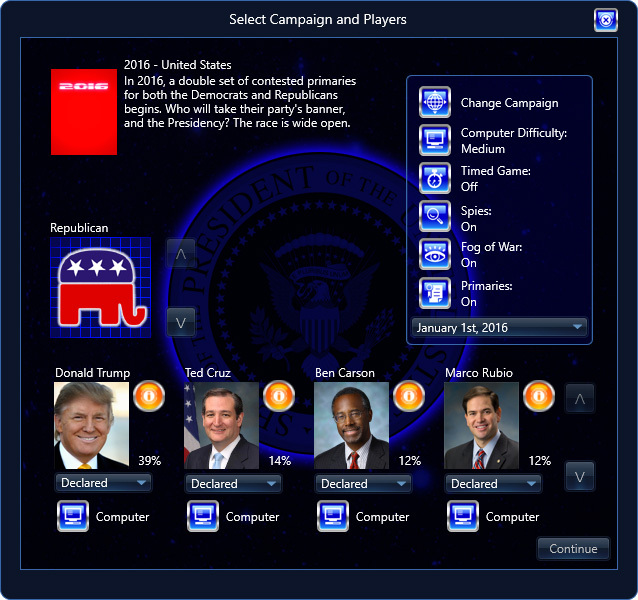 The game comes with a fully featured Campaign Editor – modify or add candidates, endorsers, surrogates, parties, change percentages, and more – or even insert yourself and run for President! Candidates have not only personal attributes (Leadership, Experience, Integrity, Issue Familiarity, and so on) but campaign attributes, which affect their campaign’s ability to respond to news stories, research electoral insights, gain a polling advantage, and more. 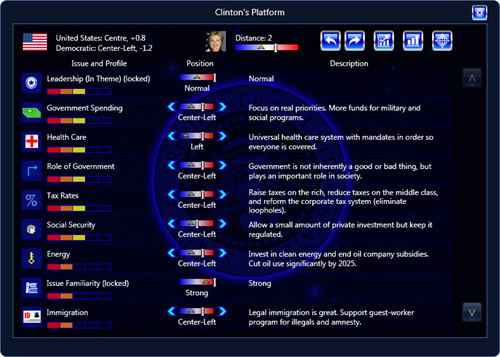 You can also select Vice-Presidential candidates, each with different attributes. The U.S.A. is a big country, and a successful candidate must focus limited resources. Choose which states you will target, and decide how much of your candidate’s resources to expend pursuing each one. Choose where to barnstorm and hold rallies, give policy speeches, and raise funds. What are the swing states? Will you target Florida, New Hampshire, Ohio, or somewhere else? The 2016 campaign comes with accurate polling data for the real-world candidates, both in the general election and primaries. 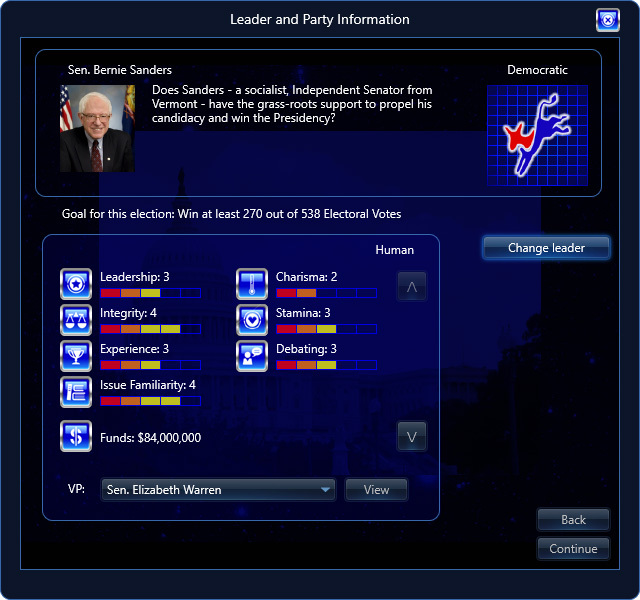 In addition to the general election, President Infinity includes the option to start in the primaries, running against all the major Republican or Democratic candidates, as well as the hypothetical ones. Who will lock up Florida in the Republican primaries – Donald Trump, Ted Cruz, Marco Rubio, or Jeb Bush? A universe of endorsers, national and state-by-state. Will that last minute endorsement in Iowa launch a wave of momentum? You can then turn endorsers into surrogates! They will then campaign for you after endorsing. Barnstorm, give speeches, fundraise to boost your campaign finances, and much more – you decide. Or perhaps it’s time to hold massive rallies to accommodate the thronging crowds and boost your reach? Establish and tweak your candidate’s key theme and beliefs on core issues. Your candidate can change the party’s platform, which will attract some voters while alienating others. While moving to the center can help attract voters, there is also a chance existing supporters will leave after a dramatic policy shift. Craft ads to target specific regions, and gain extra bonuses when you run them. Create ad campaigns to highlight your candidate’s campaign themes and platform. Better ads take more time and cost more money. The more they run, the more they cost. Carefully tailored advertising can build a campaign, but ineffective ads may waste valuable resources. Be careful – attack ads can tarnish opponents but can also backfire. Build up state-by-state command-and-control, and synergize it with your Footsoldiers to swamp your opponents’ Get Out the Vote operations in swing states! News stories can be spun to improve your candidate’s profile, for damage control, and to turn the heat up on an opponent – spin from the campaign or assign surrogates instead. From time to time, candidates are offered the chance to give interviews. These may help or hurt the campaign depending on attributes such as knowledge and charisma. 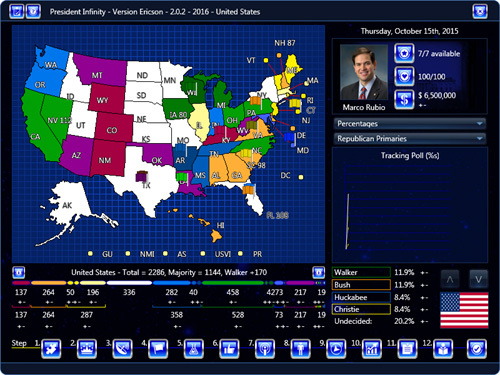 Tracking polls allow you to gauge public support and opinion on campaign issues. Positive poll numbers can help gain much-needed momentum and sway undecided voters. You can also gain insights into the electorate through polling, and use them to hone your ads or speeches. You can dig up scandals on opponents or hire spies to infiltrate an enemy’s headquarters. Be careful! This strategy can backfire if caught. Almost everything in an election costs money. Run out, and your campaign will grind to a halt. Increasing the time spent fundraising will divert your candidate’s time from other aspects of the campaign, but will build up the campaign war chest. Barnstorming, giving speeches and attending fundraisers deplete energy, which can only be restored by resting away from the campaign. Getting tired can lead to embarrassing gaffes. Command points are the strategic resources available on a day-to-day basis. They are replenished each turn, but are limited – there are never enough for all possible courses of action your campaign may wish to pursue. Making a policy speech, holding a fundraiser, spinning news stories and recruiting foot soldiers and crusaders all deplete your candidate’s precious command points. You must ensure the maximum political value for each command point you expend. Candidates have a fixed number of political points, which are used to tailor a campaign to particular political interests. These help gain endorsements, which in turn build momentum. 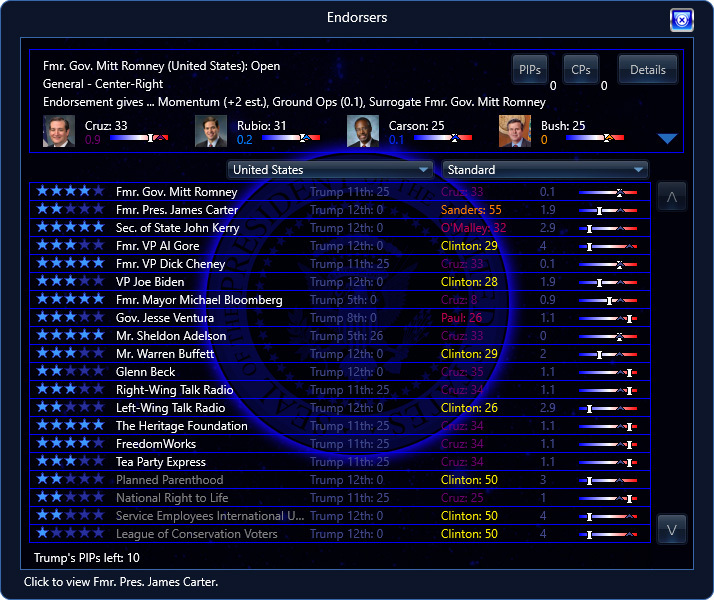 President Infinity contains a Campaign Editor, giving you the ability to modify campaigns, or create your own, including editing, adding, or removing issues, leaders, parties, endorsers, surrogates, and more. Work to get on primary ballots if you’re not. Stymied by primary ballot rules which keep your candidate off the ballot in Virginia, say? Now you can change that. Control over debates. Call out specific opponents in debates to stop their momentum, or boast about your own achievements. Secured your party’s nomination? Pivot to the general election, including choosing your Veep running mate at any point up until the convention, who will then go out and Barnstorm, give Policy Speeches, Fundraise, and more.